Omega 3 Sources are the foods with good fats. Americans are woefully deficient in these omega-3 sources of fats and they contribute to so many body functions. They contribute to our brain power, our heart and skin health and even have anti-cancer benefits. It cannot be overstated how much we need these fats in order to be slim and healthy. So how to get enough of them every single day? 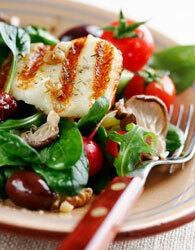 One great way is to add foods that are omega 3 sources to healthy salads. These are excellent low glycemic foods that can help to lower blood sugar. Putting them in salads is a great way to add them to your diet. 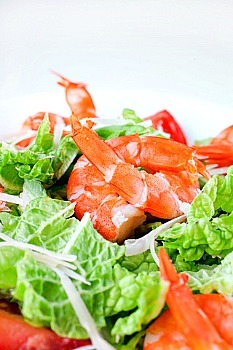 The best salads are made up of highly nutritious, fiber dense raw foods and your omega-3 proteins, fish, seeds and nuts. The marine foods are the omega -3 sources that are the fat burning foods. The richest omega 3 sources are salmon, trout, mackerel and sardines, flax, hemp seed, canola, soybean, walnut and dark green leaves. Buy wild salmon if you can find it. Flaxseeds are the best plant source of omega-3s and can be consumed in flaxseed meal that you can sprinkle on your cereal. You need at least a heaping tablespoon. Flaxseeds are very fragile when they're opened so you must keep flaxseed meal refrigerated. If you have a small coffee grinder you can designate for this purpose, it makes sense to buy the seeds and grind them yourself. They are cheaper and you will have them very fresh. We need to eat a lot more of the omega 3 sources and less of the saturated fats that are in animal protein. Most Americans eat far too many of the saturated fats and very little of the omega-3 sources. All fats should be at least 30% of our diets with the balance weighted more to the polyunsaturated, essential fatty acids. A great place to get your omega 3s is in healthy salads which, if they are made from dark green leaves are omega 3 sources of food. For most of these salads you can use a mix of dark, leafy greens so you get some essential fatty acids and more nutrients. You can add escarole, frisé, endive, radicchio or sprouts. You can add fruit for color and sweetness like orange slices or an apple or something tart like grapefruit slices. When you add chopped walnuts or almonds, salmon, tuna or avocado to a salad you have a complete, nutritious meal that can be very filling. In fact, when you add the omega 3 sources like fish, chopped nuts, seeds and avocado you have included foods that lower blood sugar. These super salads are low in saturated fat and high in omega 3 sources, the "good fats." You can buy canned wild salmon from Alaska and drain well. Have a light salad dressing so as not to consume more fats than you need. A glycemic response of a meal may be lowered by having a salad with the meal, if it has the proper dressing. The dressing must have the following proportions of oil to vinegar: 4 teaspoons of lemon juice or red wine vinegar to 2 teaspoons of olive oil. Did you know that the red potato, which is high in Vitamin C and has a low starch content can also be an excellent choice for a salad if it is cooked and chilled? Resistant starch is a type of dietary fiber found in some carbohydrates naturally and in others like pasta, rice and potatoes, when they are cooked and chilled. Pasta salad also contains resistant starch. Potatoes and pasta, are not omega 3 sources; however, chilled in a salad they are filling, nutritious and low glycemic. Resistant starch is slower to digest and does not spike blood sugar levels. Because it stays in your intestines longer it helps you to feel more full. There is more good news about resistant starch! According to John La Puma, MD in his book Big Book of Culinary Medicine, "Foods rich in resistant starch appear to help you burn fat up to twenty four hours later." So potato and pasta salads are fat burning foods as well as filling and nutritious! Add cold sliced potatoes to any green salad to make it more filling. Omega 3 sources are foods that are essential for our health in so many ways. Foods that are rich in omega 3 fatty acids support cardiovascular health, enhance our immune systems and are nourishment for our brains. To maintain fat loss and be healthy we need to add more of the omega 3 sources to our diets. Putting them in salads is the perfect way to do it. Keep reading the articles below for more information about keeping your blood sugar low with your diet! Return from Omega 3 Sources to Foods That Lower Blood Sugar. Return from Omega 3 Sources to Lifetime Fat Loss home page.